Today I noticed that when trying to DNS-resolve my Ubuntu laptop from within my home network the Fritz!Box set up failed to do its job. When looking in the Fritz!Box’s configuration menu I found out that it failed to identify Ubuntu devices by name, only by their MAC address (the corresponding name field was empty). 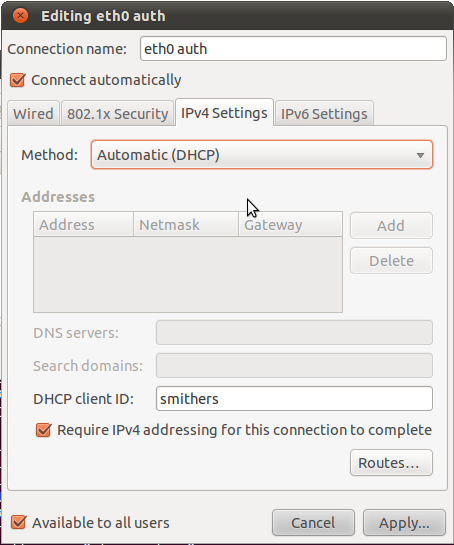 In order to “help” the Fritz!Box to identify Ubuntu devices by name simply enter the “DHCP client ID” in System/Preferences/Network Connections, as shown in the following image. This was tested with FRITZ!Box Fon WLAN 7140 Annex A, Firmware-Version 39.04.41.